Geneva Jennie Wells obituary. Carnes Funeral Home. 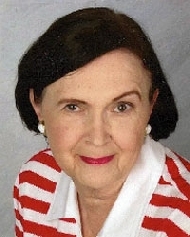 Geneva “Jennie” Wells, 80, of Texas City, passed away at her home on Sunday, November 3, 2013. Born in Kentucky, she was the daughter of the late Malcolm and Georgianna Patterson Tuggle and was also preceded in death by her first husband, James Wood Harper, and her second husband, William Wells. Jennie is survived by companion, Walter Clements, sons, James Harper of Houston and David Harper of Alvin; granddaughter, Jessica Harper Fleming and husband Stephen Fleming of Seattle, WA; brother, Charles W Tuggle of Trussville, AL; sisters, Marjorie Tuggle Armistead, of Frankfort, KY; Barbara Tuggle Fetting, of Penhook, VA; and Rebecca Tuggle Burd, of Pembroke, KY.
Jennie was a longtime resident of the greater Houston area and worked for many years at the NASA Johnson Space Center. She was very active and involved with different groups and organizations in Houston. During her life, she was a very good spirit and yet a simple woman at heart. The Family will greet guests at Carnes Funeral Home, at 3100 Gulf Freeway, Texas City, TX 77591, on Saturday, 4:00 p.m., November 16th, 2013.